A young couples car breaks down right before the annual purge is about to commence. That's really all you need to know about the plot plot for this movie. If you're like me you think, why the hell would a couple go grocery shopping before the annual Purge? Why wouldn't they go to Mexico for the weekend? Or Canada? Or anywhere but the inner-city to pick up some celery? I'm going to start this off by saying I really enjoyed The Purge last year. I know people had problems with the movie but the concept was really fun and I found the execution to be mostly enjoyable. The first film was creepy and tense, the characters made incredibly poor choices but I was still onboard. 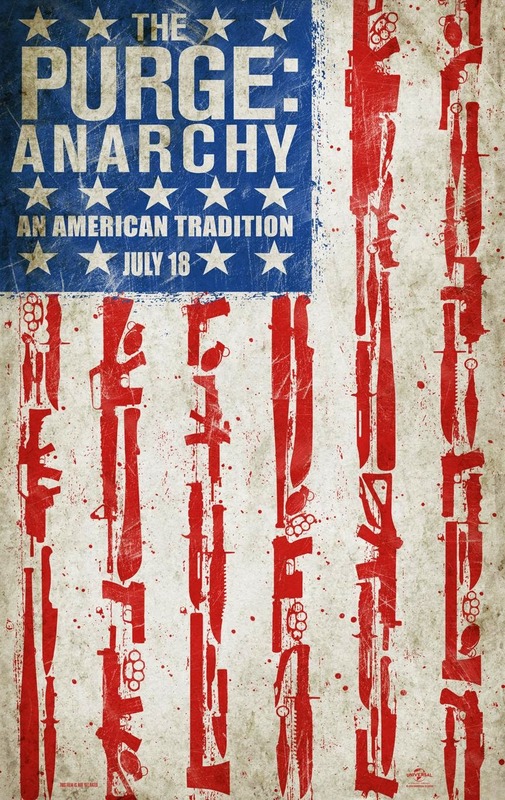 The Purge: Anarchy has removed everything that worked about the first film and replaced tension with heightened action. I never thought the original Purge was a subtle movie but it feels like an understated masterpiece after watching The Purge: Anarchy. I generally only take time to write about films that I enjoy but I'm making an exception here. I can't believe how alone I feel in my assessment of these two films. It appears that most people prefer the sequel to the original. The IMDB, metacritic and rotten tomatoes scores are all higher for this new (of what I'm sure will become annual) installment. I guess it could be argued that they took the Aliens approach to sequels with this one but Aliens did far more than heighten the action. The political commentary in The Purge: Anarchy is embarrassingly on the nose. I liked the idea that the New Founding Fathers are involved in the killing but it didn't need to be spelled out. We all got it. By the time characters are explaining what has been happening with the large military style tractor trailers, we as viewers understood what was going on for over an hour. The first film was clearly an indictment on the class system in the US and was just shy of being over the top with its political message. It appears the filmmakers felt the first film was too ambiguous and decided to remedy that with this outing. What is it about this film that is resonating more with people than the first? I seriously don't get it. I've read reviews and listened to podcasts where people who I respect are trashing the first film and mostly praising this far inferior sequel. I guess this is one of those times that I need to remind myself that I have really bad taste. I remember when I thought I had good taste, those were confusing times.